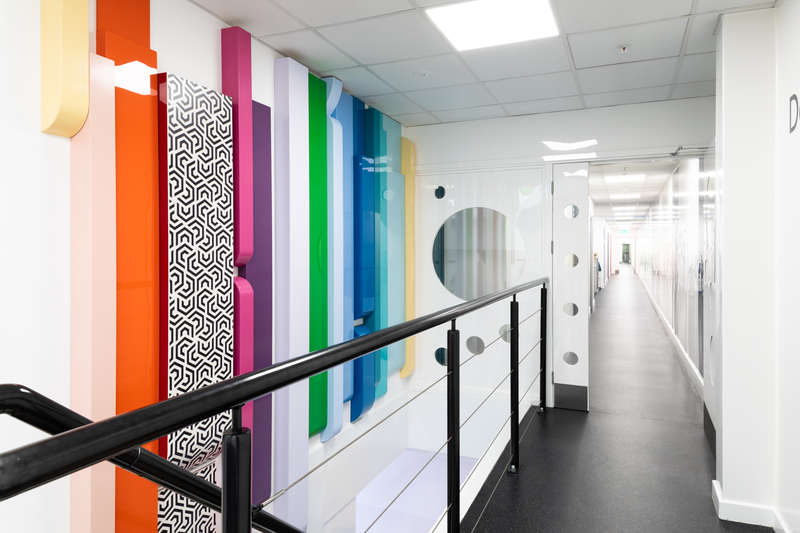 Here are some photos of the Altro Letchworth Headquarters stunning installation we designed using their Altro Whiterock Satins and Chameleon product. 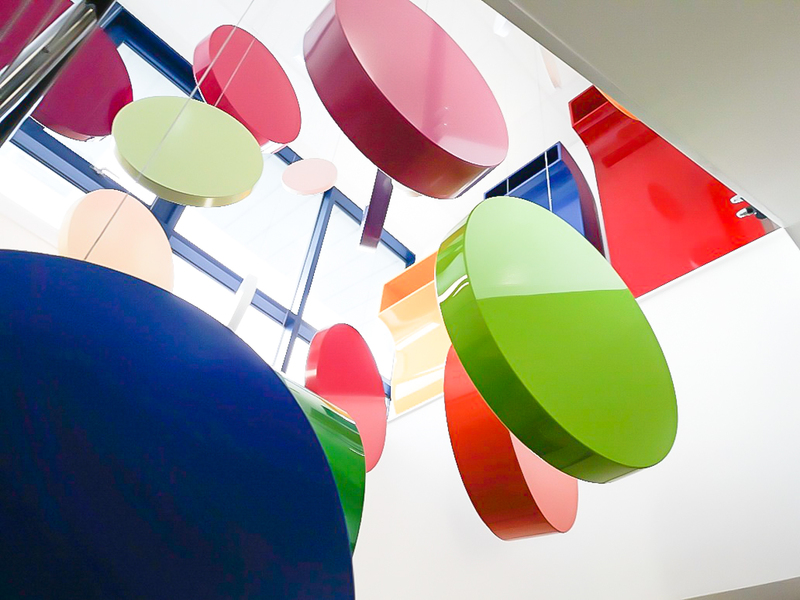 We called it ‘Extrude’ and it joyfully rises up through 3 storeys of the factory culminating in a shower of coloured spheres blowing out of big vents. 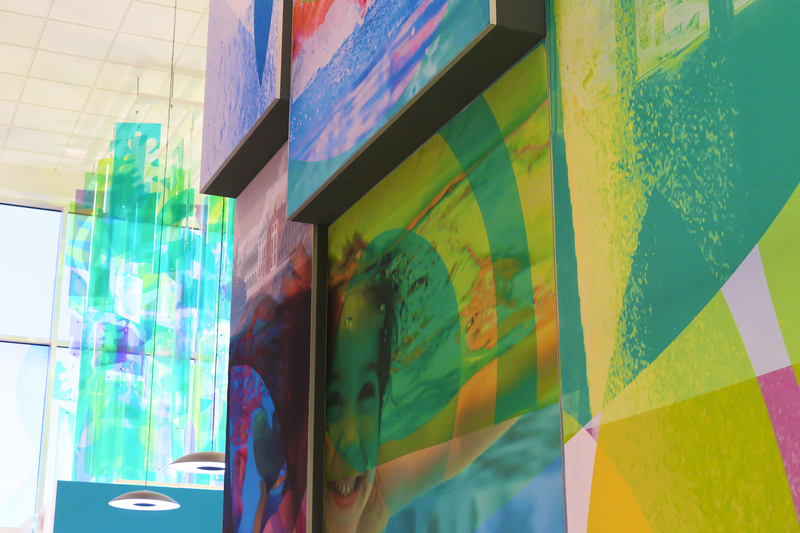 The initial brief of designing a large scale coloured manifestation for the pool hall was expanded to include various other features around the centre as well as advising the client on all the interior finishes. Main contractor Speller Metcalfe, client Worcester City Council. 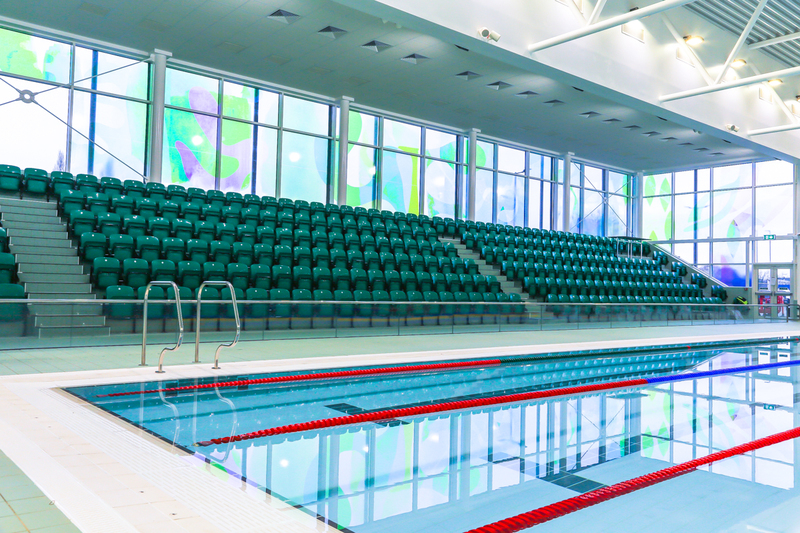 Here’s a great project we were involved in last year in September. It’s all about transformational design for outside spaces working with volunteers from the Willmott Dixon team based in Bedfordshire. We recently completed this scheme working with Leicestershire County Council and Willmott Dixon Construction. 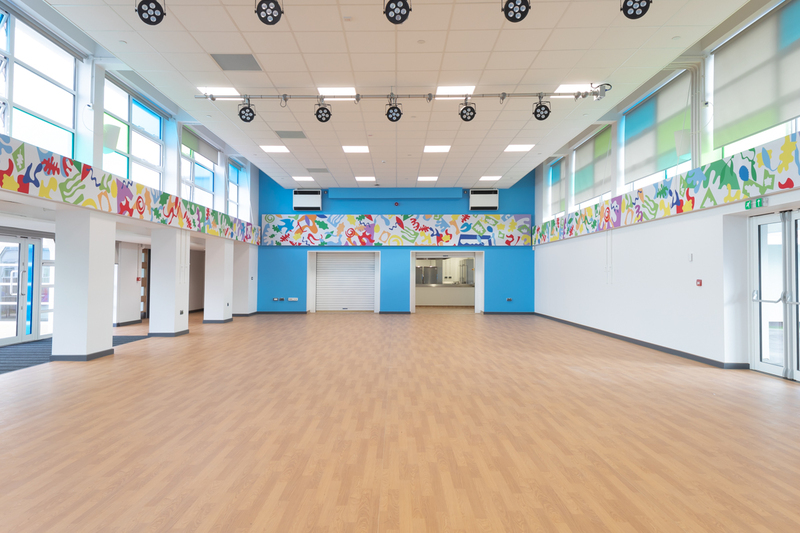 Newlands Primary school relocated to an existing 1930s school site which had a transformational refurbishment to provide the school with a new home. Refurbishment projects are often harder to resolve for an interior designer than a new build as you’re trying to tune in to the existing building architecture (rather lovely 1930s period in this case) , strip away the build up of years of detritus and develop a new overarching vision for the scheme. At the same time its important to work with the incoming school to carry over ideas and themes they’ve been using on their old site but at the same time refresh and in some cases re-direct. When it works the results are astonishing. 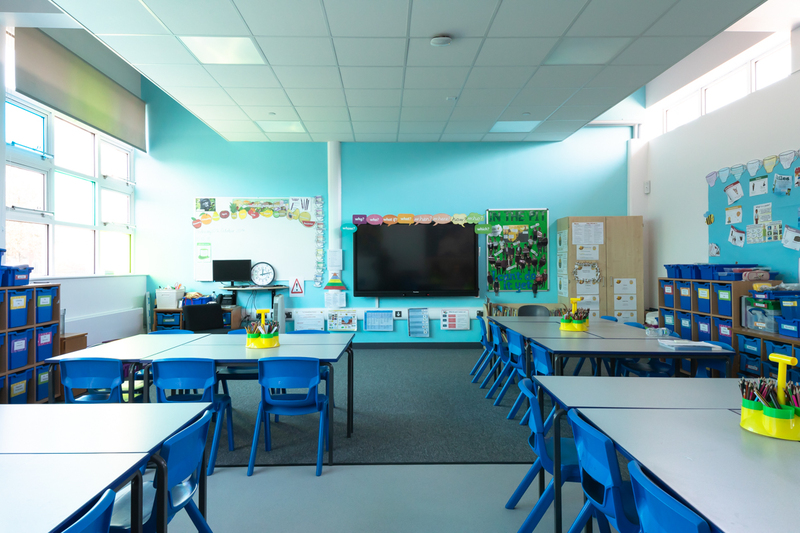 For the last year or so we’ve been working as the Interior designers for the Birkett House special school new build scheme in Leicestershire. Our client is Leicestershire County Council with the main contractor as Willmott Dixon Construction. 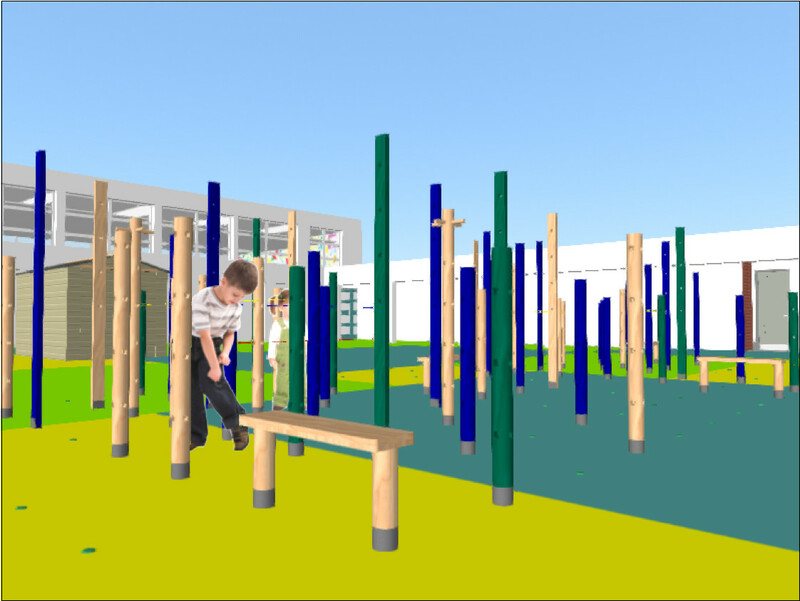 A key part of what we do are the engagement processes we like to develop with a school in order to understand how they tick so that our design can be part of the transformative outcomes for staff and pupil. One of these projects has been an inclusive mosaic project for the hydrotherapy pool that encouraged every pupil and lots of staff to produce a mosaic tile to help energise the pool area and contribute to a sense of ownership. The overall concept was that the mosaic tiles would be arranged in a pattern similar in concept to the Lego urban art interventions and the tessellated super graphics being used in other places around the school such as the circulation areas. 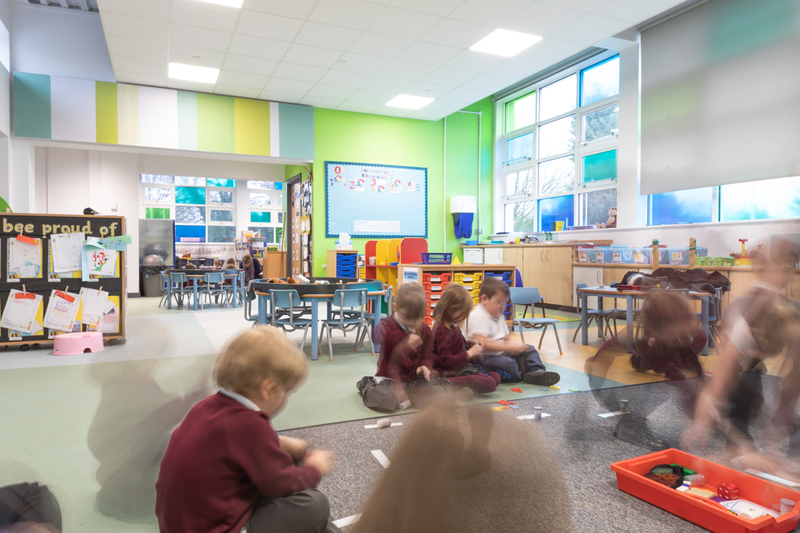 The background thinking to this is that pupils on the autistic spectrum respond favourably to logical repeated patterns which in turn contributes to a calming environment. 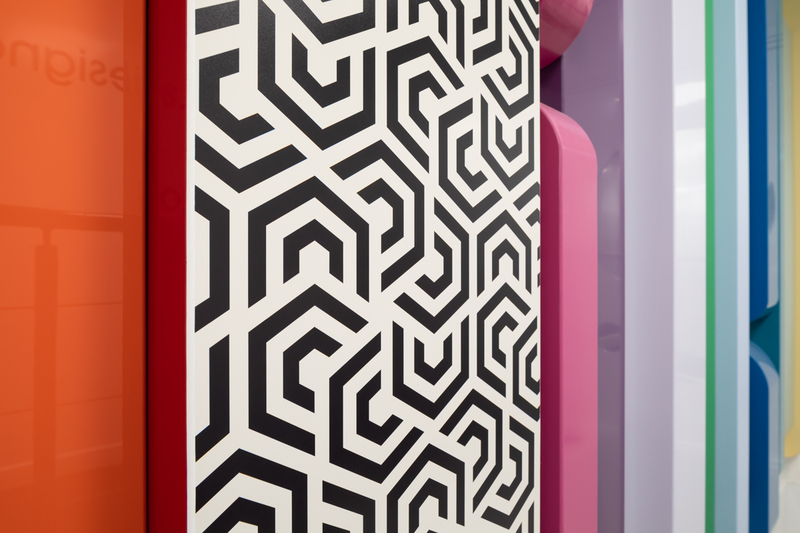 We created a template for the mosaics based on the 250x500mm standard white pool tile. This was the template that the school used to set out their mosaics. 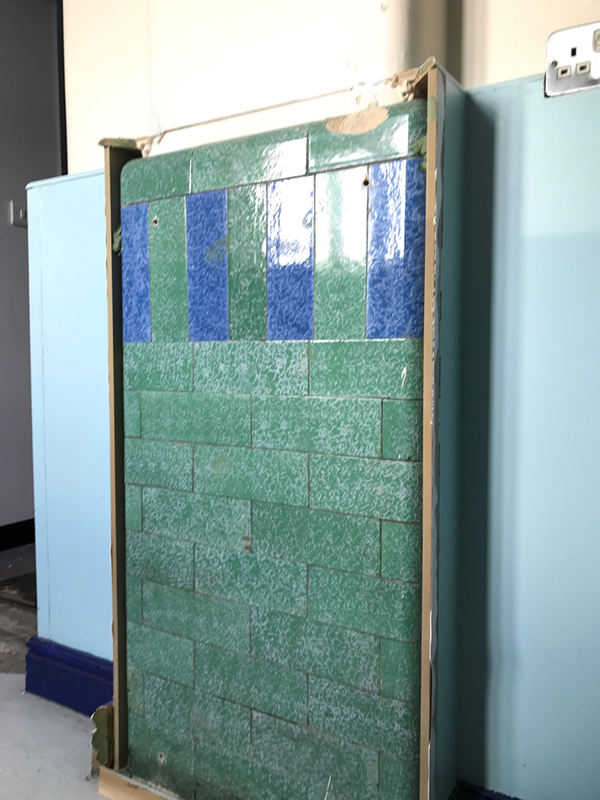 After some initial worries that we wouldn’t be able to produce enough tiles; the school eventually generated over 150 mosaic sets – more than enough! We ran inset training workshops with the staff and also supervised some of the pupil workshops to ensure that we had a consistent approach. The task itself particularly suited children on the autistic spectrum as it requires accuracy, gluing the tiles precisely within the lines, and an ability to develop abstract patterns. One member of staff working with complex needs children with limited motor skills devised a particularly creative approach on how to engage her class. Children painted their design onto the mosaic template which was then duplicated by members of staff as the final mosaic pattern. This was a very good solution to the challenge of enabling every pupil to contribute to the scheme. Today patients and staff are moving into the brand new FitzRoy House CAMHS unit. 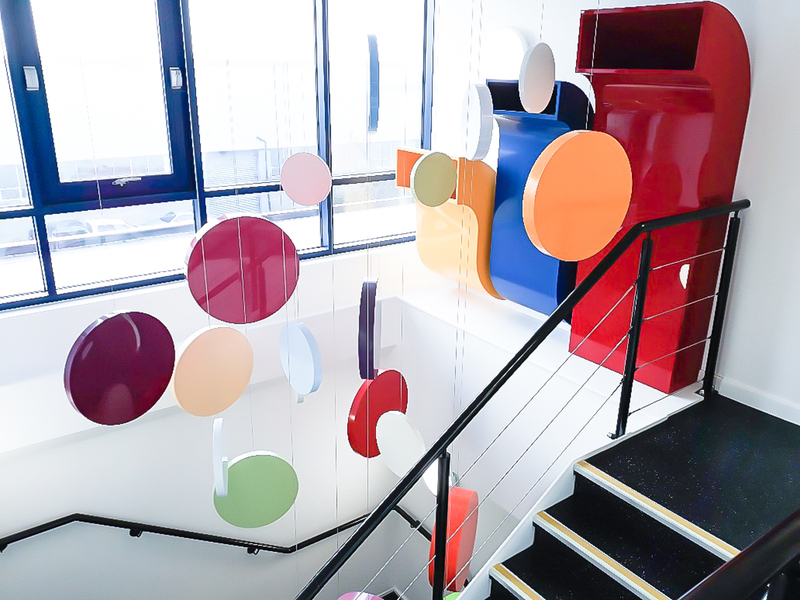 We were commissioned by St Andrews Healthcare Trust to deliver a design integration project as part of their new Child and Adolescent Mental Health Services (CAMHS) unit. 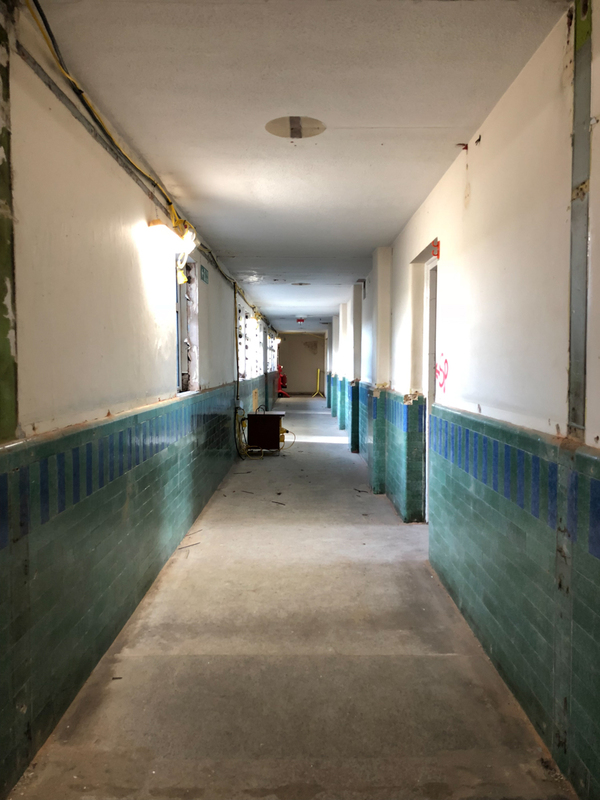 The two storey facility will give specialised bespoke care for up to 110 young people and is the largest residential mental health facility for adolescents within Europe. Early on we involved the service users in an engagement programme which explored every aspect of the new building. 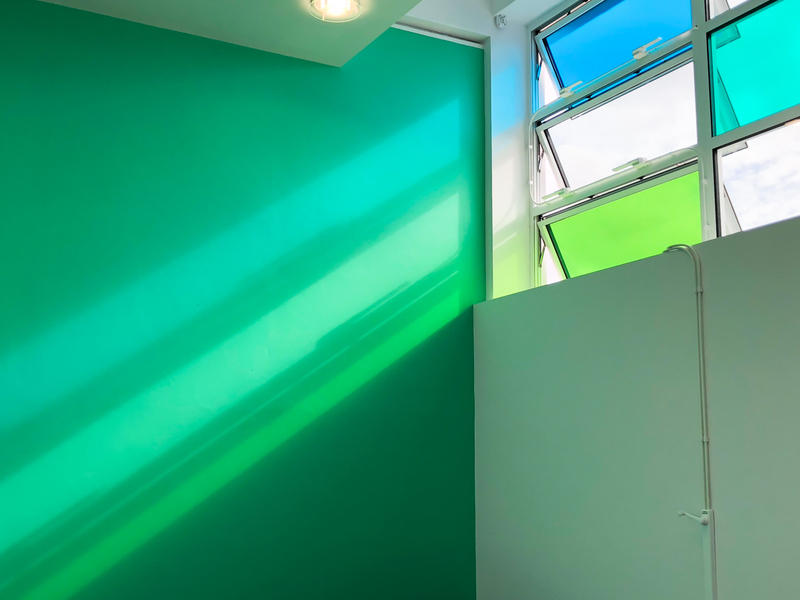 These workshops generated ideas which helped to develop the concepts for the interior design of the building; providing a positive environment and one which will ease the service users’ transition into their new building. 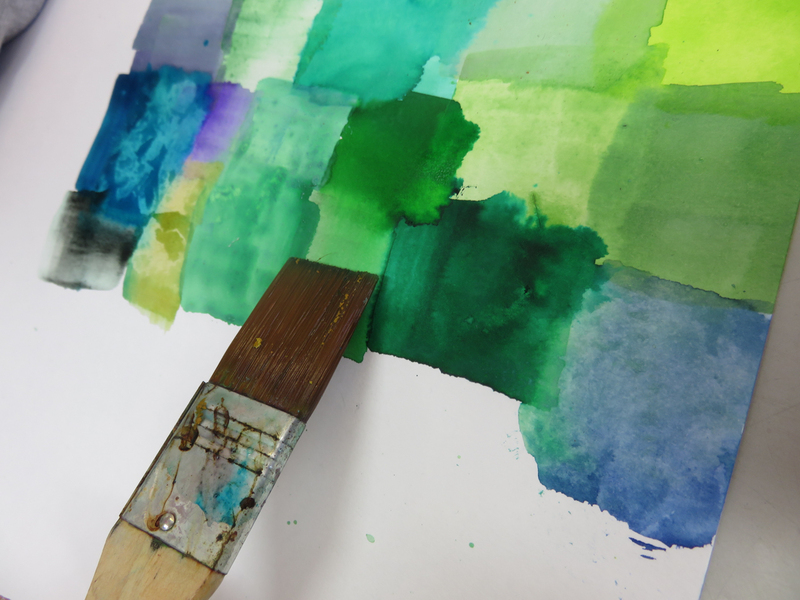 We used the workshop process to discuss how different colours made them feel which we then developed into a set of biophilic themes around nature with colour schemes linked to ‘Field + Sky’. 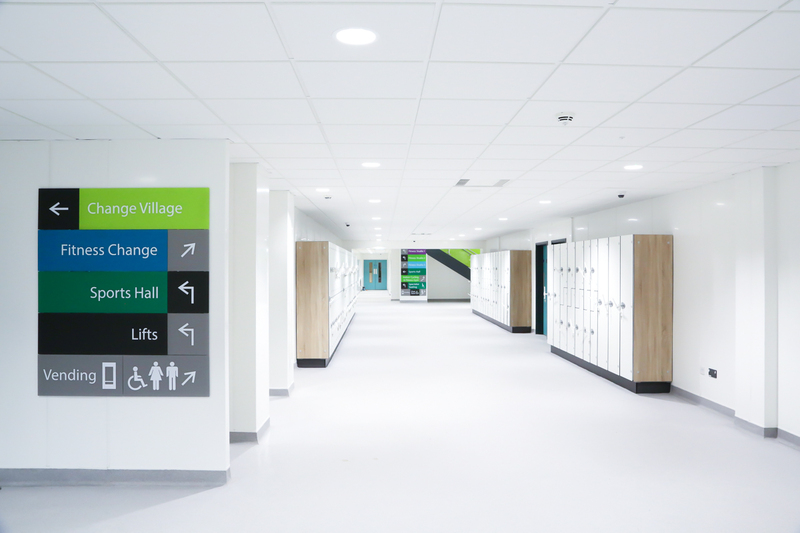 This theme and the conversations we had were used to inform the naming of the 11 new wards such as Brook, Fern and Berry and also the colours, super graphics and zones around the building. 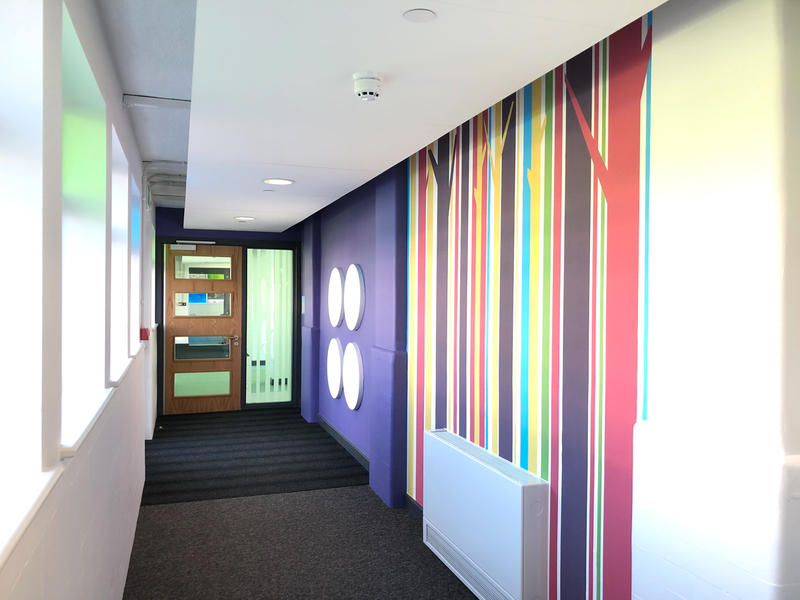 Starting in the wards; the most private spaces, super graphics were used to identify and personalise each space including the ensuite bathrooms, the dining rooms and each ward entrance. 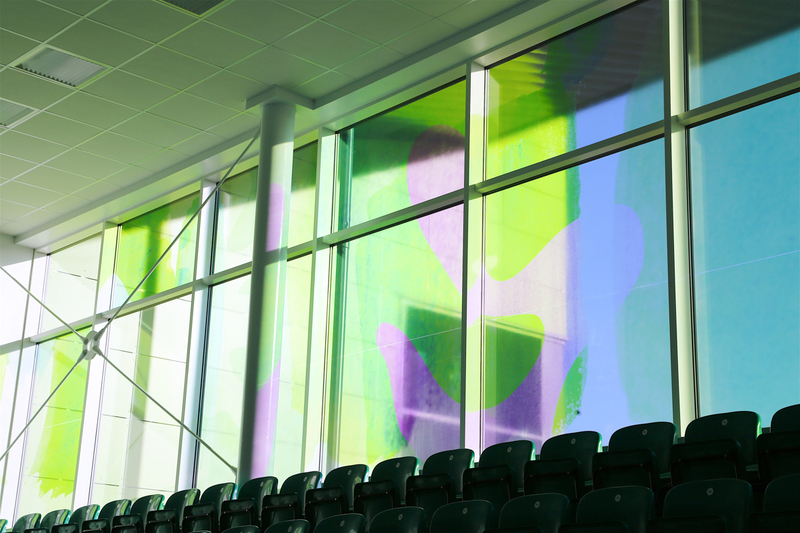 The themes and colours were also used to develop coherent wayfinding elements for the public spaces with features in the main entrance, the Education area, Sports facilities and outdoor spaces. 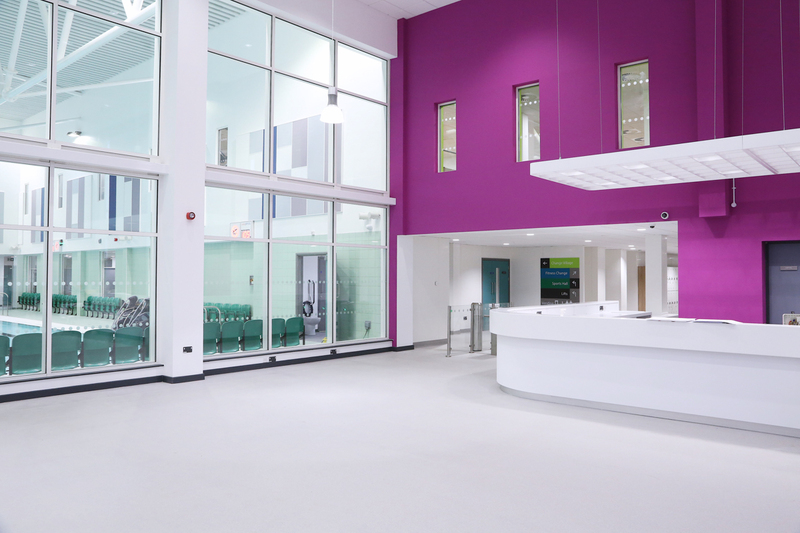 An important part of the integrated design approach was to develop modular systems which could be used throughout the building. One example of this are the display boards on each ward which will be ‘owned’ and customised by each service user as well as the circulation 3D display cases. We even worked on a 1:1 basis with one service user to create the signage for the ‘Branch Out’ cafe. 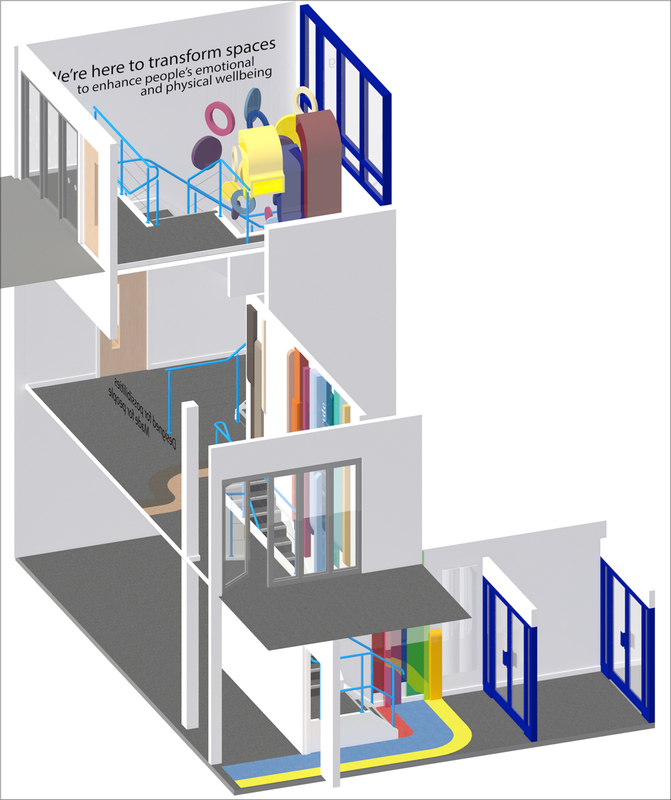 A critical part of the whole design process was the sampling and qualifying of designs and specifications for the new unit. Aside from the paramount anti-ligature concerns the client has extensive experience in what does and doesn’t work in relation to safeguarding issues for their service users. 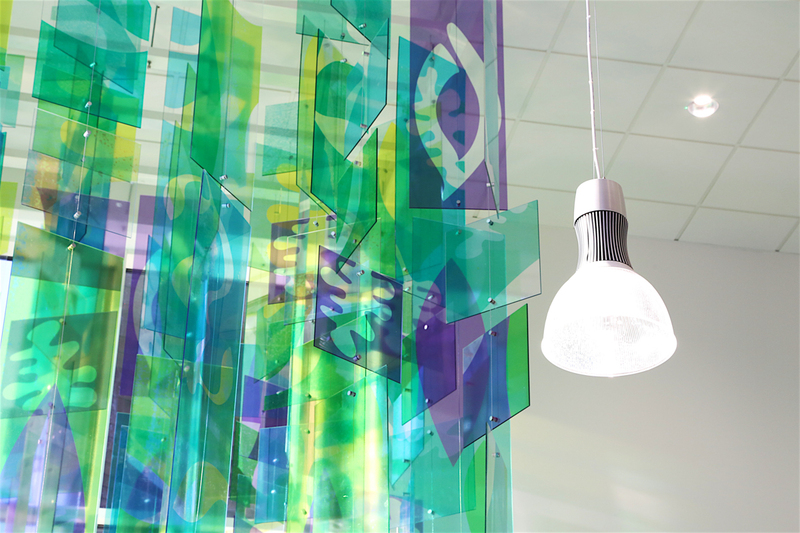 The challenge was to integrate these stringent design parameters into the various manufactured elements whilst at the same time maintaining a light touch – a hard trick to pull off but one we feel we succeeded in achieving. 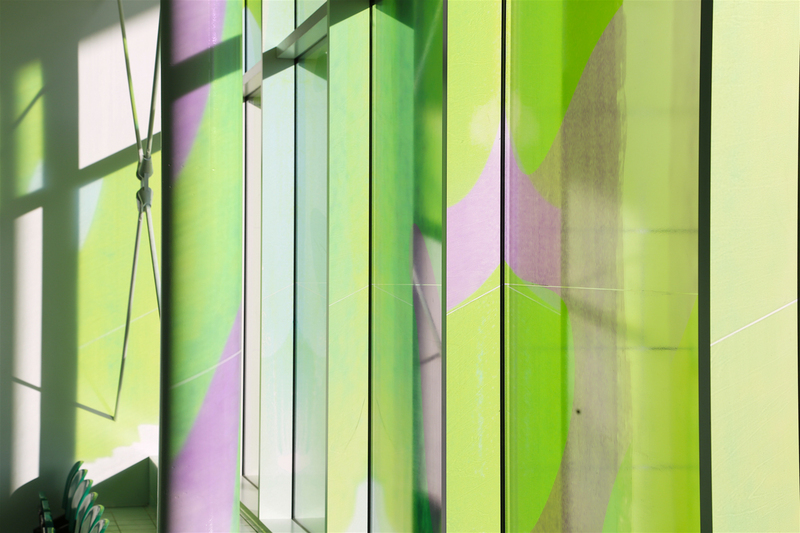 The overall feel of the spaces is of light, natural textures and colour which encourages the user to journey through the building taking a walk through fields and sky. Take a look here for more background information on the project. 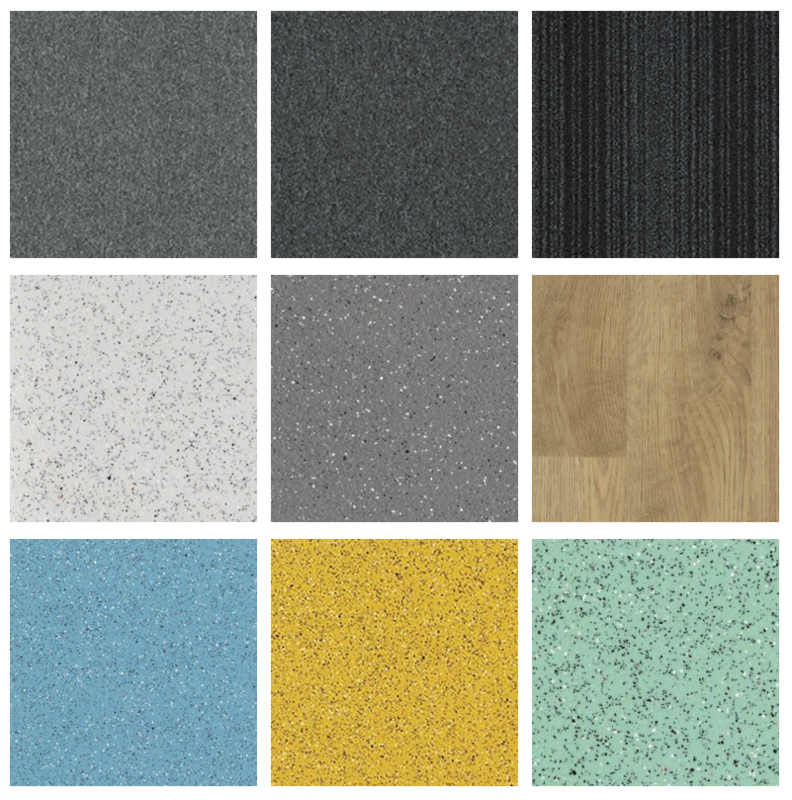 As promised here is the second instalment to the ‘Floor Is The New Playground’ challenge hosted by Tarkett. The premise of the competition or shall we say challenge was that designers would submit their designs in order to remain on top of the pile. As I played with the patterns and submitting; one other designer’s name kept popping up; René Wissinck (Follow on Twitter with @AtelierArgos) from Atelier Argos based in the Netherlands. This was going international. Via Twitter we started to exchange ideas and encouragement and then – I would argue as all designers like to do – decided that here lay an opportunity to collaborate. Isn’t that a great vindication of what social media can do to bring people together. René suggested that one of us could start a pattern, screenshot it and send it to the other to then complete and submit. A sort of graphic game of tag if you like. Now we’re talking design collaboration. Another vista of infinite opportunity opens up. So René and myself decided to take the game up to a new level. We each set eachother a challenge by developing a pattern and then sending just a portion of the design to eachother. The aim was we would then both complete a design and compare the results. 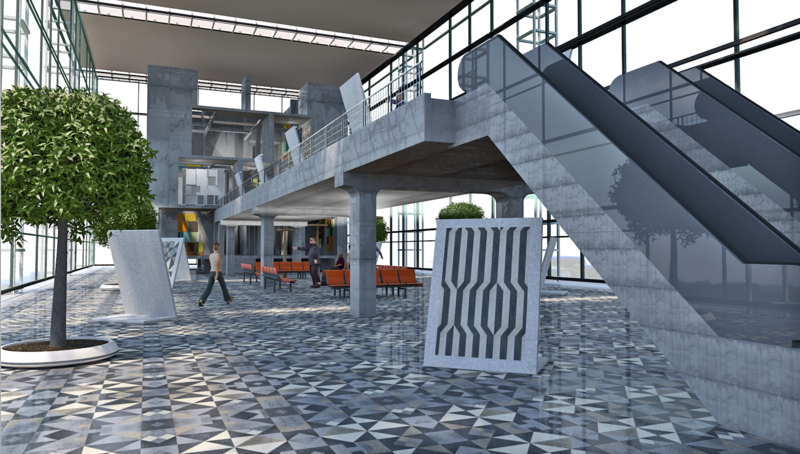 Not content with that we then decided to start put the patterns into 3D models so as to render the patterns into flooring designs. 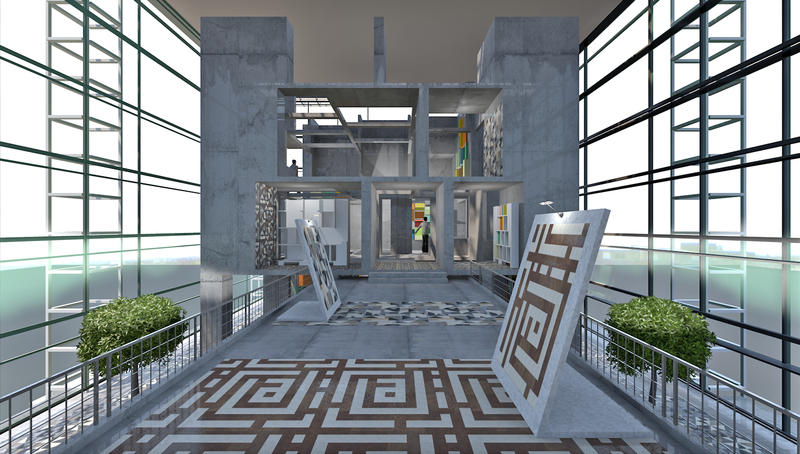 By this point we were beginning to see how the quick online game could be turned into a practical tool for flooring design. 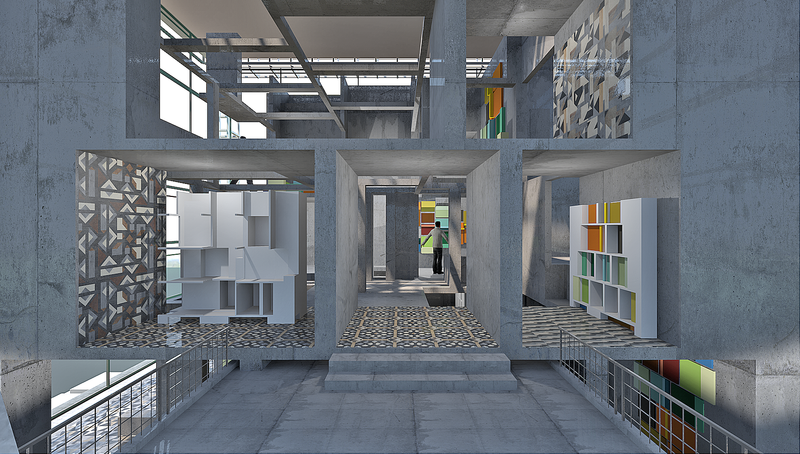 René agreed to do the design ‘heavy lifting’ and worked hard to generate the model and visuals. 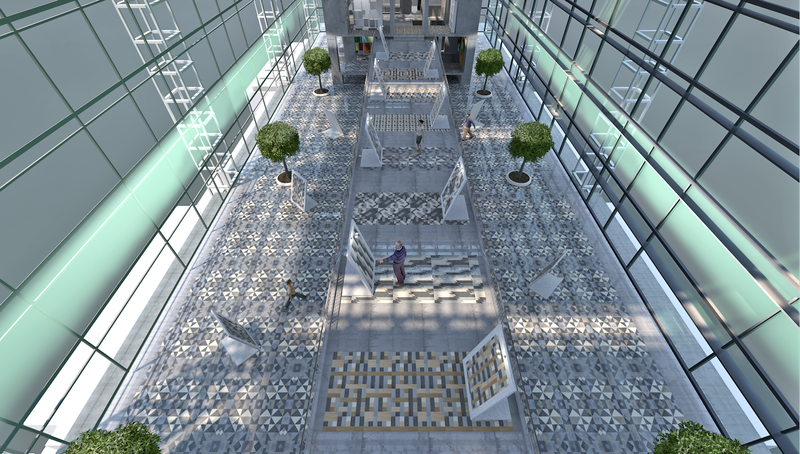 Naturally he took it a step further and created a complete environment – the new virtual ‘Floor Is The New Playground’ exhibition hall. Into this space he assembled many of the designs that we had both developed. Some were placed on the floor whilst others became part of a virtual exhibition. Well the game brought myself and René together as designers and we’ve really enjoyed the collaboration. Wouldn’t it be great if we could take it even further into an actual project collaboration.